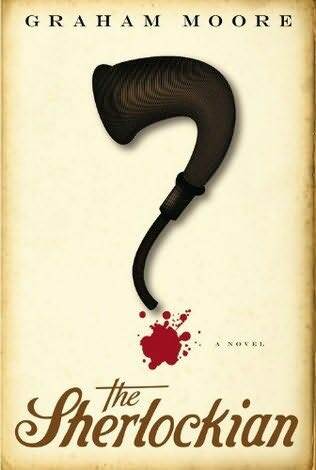 The Sherlockian was the third book I tried to read this week and apparently third time's the charm, for I very much enjoyed this book far more than the other two I tried to struggle through! I really like the idea of Sherlock Holmes. After seeing the Robert Downey Jr. film and reading Neil Gaiman's 'A Study in Emerald' I finally got around to reading A Study in Scarlet. I've also watched Steven Moffat's Sherlock, loved it. I'm halfway through The Sign of Four right now. I've probably spent more time on Arthur Conan Doyle and Sherlock Holmes' Wikipedia pages than I have reading the actual books...Basically, I like Holmes but I'm not one of those people who have read all the books and scorn adaptations. I like the characters and I like the community surrounding the books and I like all the analyzing of the stories and the real world facts and such. (I'm kind of like one of those people who like biographies of authors but not the author's actual works, heh). Just wanted to clarify that before I continue with my thoughts. I can't really speak to the accuracy or factuality of the story and I presume I would have enjoyed the book even more if I was more of a Sherlock fan, but I am enough of a fan to have enjoyed this story. The Sherlockian tells two stories in alternating chapters. There is the story of what Arthur Conan Doyle was up to during the period for which his diaries are missing and the story of a new member of the Baker Street Irregulars trying to solve the mystery of a murder and the location of the missing diaries. I enjoyed both stories equally, which is something that doesn't happen often. They blended well with one another. Even if the characters and plot were sometimes dull or at least, not too exciting, the prose made up for it. Moore's prose is easy to read, smooth and flowing. I had fun reading this book. Even though it was a murder mystery, 'fun' is the adjective that keeps popping into my mind. Fun to read, easy to read, enjoyable to read. It was a murder mystery that someone like me, who normally despises murder mysteries, could enjoy. (Moore used the characters' first names! ;P) I could really appreciate the creativity that went into crafting this story, the explanations for what happened and why the diary went missing, etc. "It's a case worthy of Sherlock Holmes himself," said Inspector Miller with a smile. Arthur thought again of dueling. There would indeed be a fight this day. But not with this foolish inspector. "No," began Arthur. "It is not a case worthy of Sherlock bloody Holmes. It is a case worthy of his creator." And with that, he marched out, swinging the door shut and leaving Inspector Miller alone to contemplate what mayhem he'd just wrought. As I just mentioned earlier, I enjoy reading about authors, how they lived and worked. I like the appeal of reading imagined stories about real people who lived such a long time ago. Reading about authors in a fictionalized novel makes them feel more real to me, oddly enough. You can hear various facts about someone like Conan Doyle but when you read a scene where he's chatting with Bram Stoker, I find it gives me a kind of magical feeling. The writing brings the old dead author (not to be to blunt about it :P) to life, makes him feel like a real person. I like that a lot.